1.Precise cut off length setting. 2.Auto head elevation and quick approach control. 3.Nesting fixture device for bundle cutting. 4.Cutting piece counter with auto-shut-off. 6.Power-driven blade cleaning brush and coolant cleaning flush hose. 7.Carbide and roller blade guides. 8.Hydraulic shuttle vice back-jaw feed method. 9. Hydraulic blade tension control. 12.Two-way open rear vice jaws to ensure precise bar-feed repeatability even in cutting a little bit warped / surface rough works. 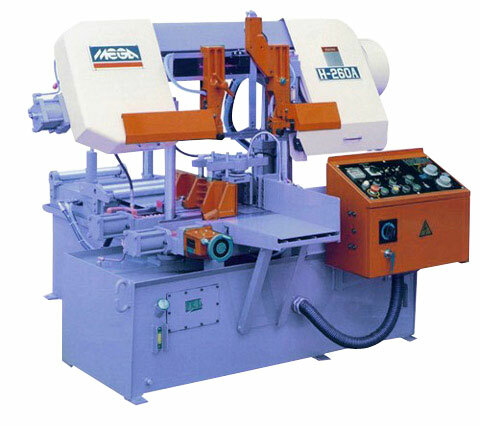 13.Unique split machine vice allows cutting to within as little as 50 mm of end automatically.